I had this idea for a stone garden wall while visiting the Tillamook Cheese factory (home of the famous Tillamook cheddar cheese) in Oregon. While waiting for Robin to buy her ice cream, I ventured outside and sat on a low wall that sloped with the grade. 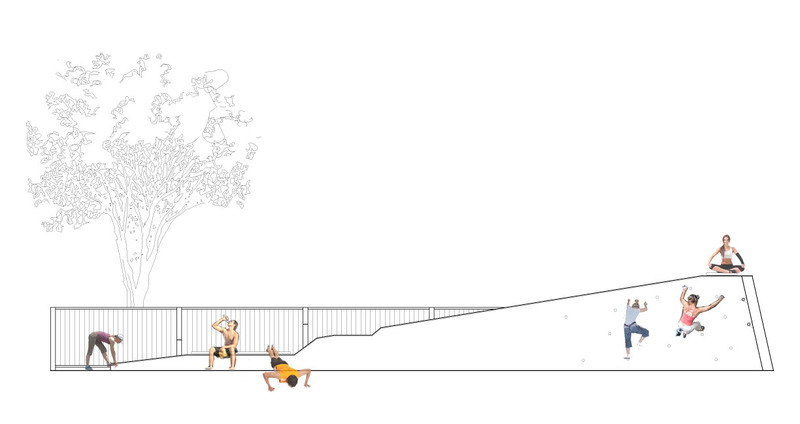 I thought about how engaging a sloped wall could be and how many activities it could provide. In the image above, the wall starts at about 6" and slopes to sitting height. One could use the wall for stretching, strengthening or sitting. At higher slopes, you could engage your upper body. The wall becomes a climbing wall as it reaches its full height of 9'. Of course, it's complete with a little sitting platform for a good view into the neighbors yard.